On behalf of MisterX6 we’re pleased to offer you his latest library creation for X-Plane 11 … HD Forests. According to MisterX6 “This package replaces X-Plane’s default forests with higher resolution textures. Please note that this package only contains summer textures at the moment. Place it underneath any seasonal tree replacements in your “scenery_packs.ini” file. But how do you need to install this package? 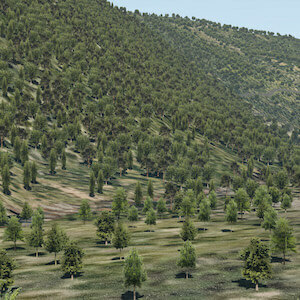 Go to the “X-Plane 11/Custom Scenery” folder and copy the whole folder ”HD Forests” to “X-Plane 11/Custom Scenery”. Go to the “X-Plane 11/Resources/default scenery/1000 autogen/forests/textures” folder and copy “autogen_trees_ALB.dds” to “X-Plane 11/Resources/default scenery/1000 autogen/forests/textures”. Note that both steps work independently. Step 2 replaces the textures for trees that are attached to autogen houses. If you don’t want to be asked to overwrite the texture file each time you update X-Plane, you can skip step 2. One or more textures in this package have been created with images from Textures.com. These images may not be redistributed by default. Please visit www.textures.com for more.